Clear blue sky's tonight but as the sun went down, guess there was a line of clouds on the horizon that did give off a little color. We've had just a flash of sunset the last few nights (probably not 3 minutes from start to finish) but sunrise at least was better. 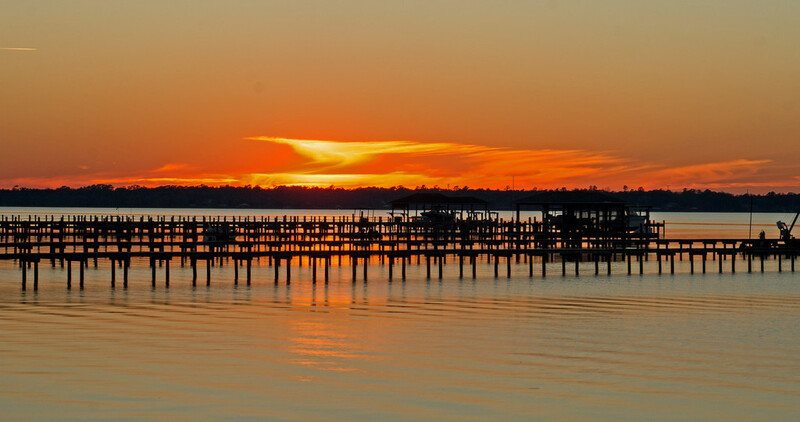 I love those pier silhouettes against the color. Another stunner Rick, wonderful tones and shapes in the sky, fav! Love all the lines and angles in the silhouettes! @kwind @milaniet @amyk @mjalkotzy @koalagardens @ludwigsdiana @gilbertwood @ladykassy46 @lyndemc @jgpittenger Thanks everyone, really appreciate all of your comments, view's and fav's. Sometimes, I wish there wasn't as many piers out there. Sort of takes away from the shot in some cases.